Blaze and Kerian's Scrapbook updated 12.07.2013 snow pictures..
Blaze 2 days after we got him he was 9 months old at the time.. He was a lot lighter in color. Blaze with one of him favorite toys a stuff dog. Blaze in his new bowtie for Xmas pic. Aww ... Blaze is so pretty!!! I don't know why, but I thought Blaze was black/white from his bowtie pic, I didn't realize he was a red! What a gorgeous color. I dunno what's up, but it says the pics have been deleted or moved and can't see Blaze, but I love seeing red ones! I do not know what is going on either. I can see the pictures still. Can someone that knows about this site help me out. 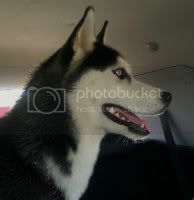 I wanted to add this picture so you can see Blaze's Blue eye ( the angel side of him) and the Brown eye ( the devil in him. I am sure you all know about the angel and devil in your huskies. You said on my scrapbook that he and Sabaka look alike... I was so excited to see for myself but I'm seeing the "Image was moved or deleted" message as well. If I copy from photobucket to put on the forum, I have to leave that pic in photobucket or it will show up on the forum that I deleted the pic. So basically you have to keep the original source of your pic in order for it to stay in the forum. Okay I figured out what I probably did and correct it I hope. Would someone let me know if you can or can not see the pictures.. Thanks for let me know I guess I figured out what I did wrong..
Xiah looks SO similar to Blaze at 9 months old. I love the color he is. Would love to see pictures of Xiah.. How old is he?? Blaze is 16 months now.. I post over on your welcome she is a real beauty. I would love to get a second Husky but my Hubby keeps saying no No NO only one dog. Blaze is adorable! I love the dark red color ...and the pink(ish) nose! Blaze has the prettiest coat color I have seen. Raven is a cutie pie. I thought I wanted a black and white but could not find one but we did find Blaze and a fell in love with at first site. I love his face mask! Especially how he has an "X" between his eyes hehe too cute! A morning at the dog Park with Blaze. There was only one other Husky at the park today a red also.. Last week when we went there wasn't any. The other Dog park here has closed for the winter there are alot of Huskies that go to it last summer. Oh I LOVE his forehead marking! Just posting a very intereing photo of blaze. Subject: Re: Blaze and Kerian's Scrapbook updated 12.07.2013 snow pictures..